A transitional or interim overdenture is made from an existing removable partial denture, the individual’s own teeth or from both, that is to be replaced after a suitable transitional period. An immediate overdenture is an overdenture constructed for insertion immediately after the removal of natural teeth; it may be used as an interim prosthesis. A remote overdenture is an overdenture other than transitional or immediate overdentures. 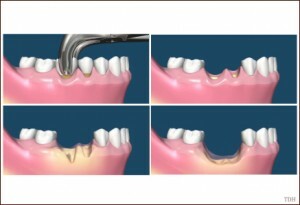 It is usually constructed for insertion at sometimes remote from the removal of hopeless natural teeth. Although remote overdentures can be entirely constructed of resin, metal bases are frequently used. 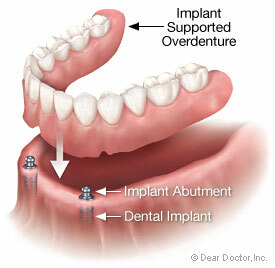 A wide variety of implant types and procedures have been used with an overdenture as the means of a final restoration. Although it is used mostly with fixed types of prosthesis, on occasion single fixtures are placed on each side of the midline and an overdenture is fabricated over the fixtures. To prepare the teeth that will support the overdenture, portions of teeth that extend above the gum line are removed. Next, root canal treatment is performed on these teeth to remove any trace of infection. Small metal caps (copings) or attachments may be covered over the root canal treated teeth for added protection. To begin the process of making an overdenture, impressions of the mouth are taken and used to make precise working models of the individual’s mouth. The remaining steps are similar to the construction of partial or complete dentures.